The March 5 West Hollywood City Council election is more than a month behind us, and it was no surprise to most that the three incumbents won. However, a breakdown of the overall votes by precinct offers a little insight into who was backing who and the risks one of the incumbents faced. First, it might be worth noting that some voters couldn’t find more than one or two among the 11 candidates that they deemed worth of their support. There were 6,170 ballots cast, with each voter getting to make three choices to fill the three Council seats up for re-election. If each voter had made three choices, a total of 18,510 votes would have been cast. However, the total number of votes cast was 16,230. That means 2,280 votes were withheld. That might have been the result of 2,280 voters withholding one of their three votes. Or it might have been the result of 1,140 voters withholding two of their votes. Or something in between. Another thing that stands out in the tally by precinct is that incumbent Lauren Meister, who came in second behind incumbent Lindsey Horvath, actually beat Horvath in one precinct of the nine precincts. That was precinct No. 72A, which covers West Hollywood West. Meister got 313 votes there and Horvath won 244. Meister lives in West Hollywood West, which has the city’s highest concentration of home-owners. She is a former officer of the West Hollywood West Residents Association and known for her advocacy for home owners. Also of interest is the fact that incumbent John D’Amico, while he won re-election, actually lost to challenger Sepi Shyne in three of the city’s nine precincts. D’Amico, a two-termer, came in third in the overall election. Shyne, in her first race for City Council, came in fourth. Shyne won 277 votes to D’Amico’s 268 in Precinct 40A, which is bordered on the north by Santa Monica Boulevard, on the east by Fairfax Avenue, on the west by La Cienega Boulevard and on the south by the City of Los Angeles. Shyne beat D’Amico by a bigger margin in Precinct 17A with 347 votes to D’Amico’s 260. 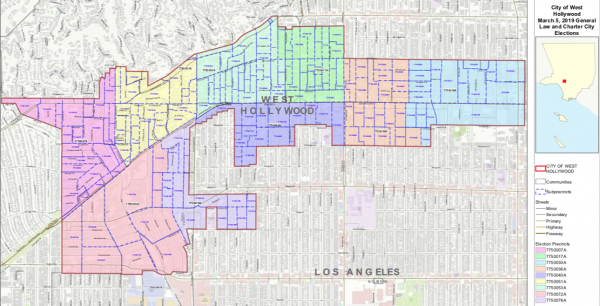 That precinct’s boundaries are Fairfax Avenue on the east, Santa Monica Boulevard on the south, Havenhurst on the west and the City of Los Angeles on the north. And Shyne beat D’Amico by an even bigger margin (102 votes) in Precinct 36A, where she scored 311 votes to D’Amico’s 209. The precinct’s boundaries are Fairfax Avenue on the west, Fountain Avenue on the north, Willoughby Avenue on the south and Curson Avenue on the east except for a block south of Romaine where it crosses Sierra Bonita Avenue. So if you look at the neighborhoods where Sepi beat D’Amico they have one thing in common: Housing insecurity. Center Center is home to thousands of long term tenants who feel besieged by residential development and face high rates of tenant harassment. These neighborhoods often feel left out of the conversation about the City’s future and worry that their West Hollywood future is in doubt. Where did all the money go? Are final spending reports on? July 31 is the deadline for the next report.